Version 8.7 of VintaSoft Imaging .NET SDK has been released. Now HTML5 and SVG image viewers can display images and PDF documents in the multipage view mode. Added support for multipage view mode in all visual tools for HTML5 and SVG image viewers. 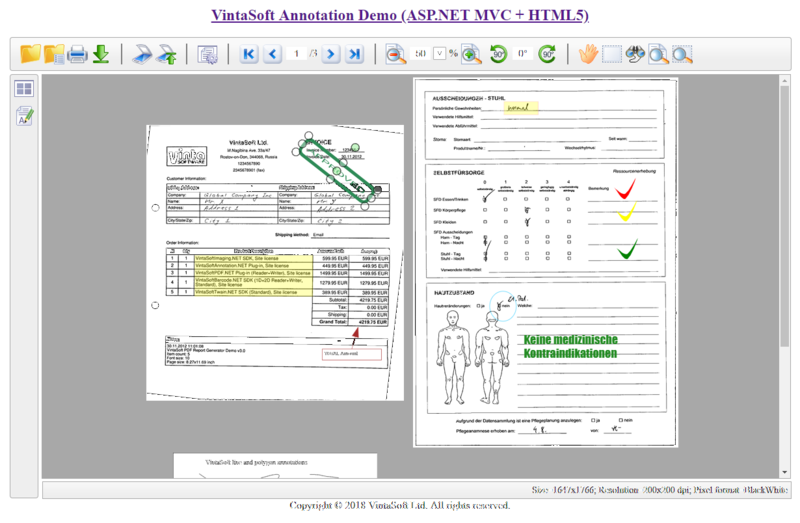 ASP.NET WebForms and ASP.NET MVC demo applications provide now the ability to view images and PDF documents in multipage view mode. Created new ASP.NET demo application - OcrDemo, which allows to recognize text in images and save results to a text file or PDF document. Created new ASP.NET demo application - FileConverterDemo, which allows to convert image files or PDF documents. Added the support for PDF 2.0. Added the ability to validate PDF document conformance with PDF/A-1a, PDF/A-2a, PDF/A-3a specification. Added the ability to convert PDF document to PDF/A-1a, PDF/A-2a, PDF/A-3a document. Added the ability to create marked content. Added the ability to remove duplicate resources from PDF document. Added the ability to invert content of PDF page. New visual tool - PdfCropSelectionTool, allows to crop PDF page in image viewer. Reconstruct image in orthogonal plane (sagittal, axial or coronal) from a stack of DICOM images (2D MPR). Reconstruct image in oblique plane from a stack of DICOM images (3D MPR). Reconstruct image in curved plane from a stack of DICOM images (Curved MPR). Reconstruct image with intensity projection: MIP, MinIP, Avg. Use multiple threads for image reconstruction. Save reconstructed image to a file. View reconstructed images in image viewer. Combine 3 image viewers for displaying 3D MPR. Combine 2 image viewers for displaying Curved MPR. Combine several image viewers for displaying images in different planes - architecture is open. Browse reconstructed images in image viewer using mouse. Change the window level of reconstructed image in image viewer using mouse. Pan, zoom, rotate in 2D space, rotate in 3D space reconstructed image in image viewer using mouse. Measure objects (line, polyline, ellipse, angle) on reconstructed image in image viewer using mouse. Now HTML5 and SVG image viewers can annotate images and PDF documents in the multipage view mode. Version 8.7.0.3 of VintaSoft Imaging .NET SDK has been released. Improved work of WinForms and WPF image viewers in multipage display mode. Created new command - PdfDocumentCleanupCommand, which allows to cleanup structure of PDF document, i.e. remove unused elements from PDF document. 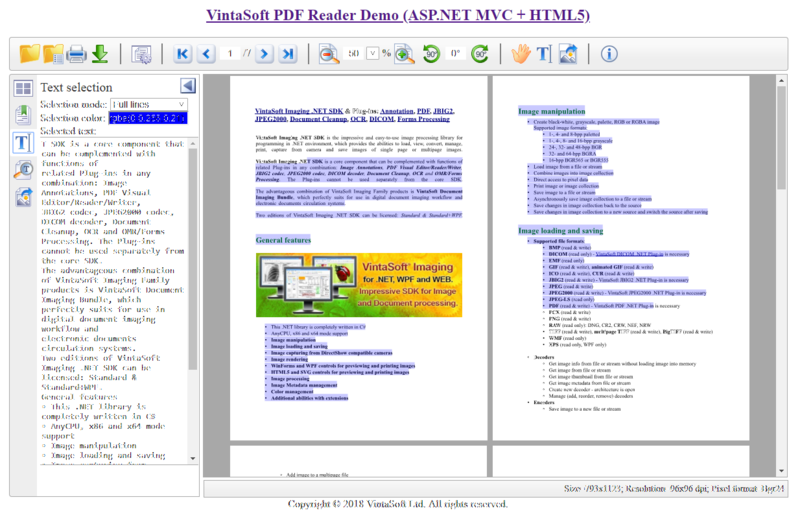 Added the ability to cleanup structure of PDF document while converting PDF document to PDF/A. This allows to get PDF/A document of minimal size. Fixed the bug in algorithm that generates progress in PDF decoder. Fixed the bug in PDF/A converter. Now DICOM decoder supports DICOM images with RLE compression and 32-bits per channel. Version 8.7.0.5 of VintaSoft Imaging .NET SDK has been released. Fixed the minor bug in image viewer. Fixed the minor bug in annotation viewer. Added the ability to remove optional or marked content from PDF document. Functionality is added to the PdfEditorDemo and WpfPdfEditorDemo. Improved the algorithm, which allows to select text on PDF page. Fixed the minor bug in renderer of PDF pages. Version 8.7.0.7 of VintaSoft Imaging .NET SDK has been released. Improved support of DICOM MPR. Several optimizations in DICOM decoder. Fixed minor bug in DICOM decoder. Version 8.7.0.9 of VintaSoft Imaging .NET SDK has been released. Added new image processing command - ColorBlend16Command class, which does 16 bits-per-channel color blending in 48- and 64-bit color images. Added 16 bits-per-channel processing of 16 grayscale, 48- and 64-bit color images in RotateCommand class. Added 16 bits-per-channel processing of 48- and 64-bit color images in ChangeHueSaturationLuminanceCommand class. Increased the performance of image rotating algorithm in RotateCommand class. Added the ability to convert images to image-only PDF/A-1a, PDF/A-2a or PDF/A-3a document. Several improvements in PDF/A converters. Improved the algorithm that removes transparency from PDF content in RemoveTransparencyFromContentStreamCommand class. Version 8.7.0.11 of VintaSoft Imaging .NET SDK has been released. Improved the algorithm that removes unused resources from PDF document. Increased the rendering performance of PDF documents with complex vector content. Version 8.7.1.1 of VintaSoft Imaging .NET SDK has been released. Created the new image processing command - TransformImageCommand, which allows to apply an custom transformation to an image. Created the new image processing command - ColorBlend16Command, which allows to blend colors in Bgr48 and Bgra64 images. Now image processing commands can automatically convert an image to the pixel format, which is supported by the command. Added the 16 bit-per-channel processing in ResizeCommand, ImageScalingCommand and RotateCommand commands. Improved the performance of RotateCommand and ResizeCommand. Added the ability to control the interactive point cursors of visual tools. Fixed several bugs in CompositeUndoManager class. Fixed several bugs in UndoManager in multipage view mode. Several bug fixes and improvements in ASP.NET demo applications. Added the ability to remove optional or marked content from PDF document. Create the PdfDocumentCleanupCommand class, which allows to remove unnecessary elements from PDF document. Improved the algorithms, which remove content from PDF document. Added the ability to evaluate changes, which appeared after signing the PDF document. Added the ability to verify Timestamp signatures (ETSI.RFC3161). Improved the work of WebPdfTextSelectionToolJS visual tool in multipage view mode. Added new visual tools to PdfEditorDemo, PdfReaderDemo and WpfPdfEditorDemo: MagnifierTool, ImageMeasureTool, ZoomTool, ZoomToRectangleTool. Added the ability to remove the optional or marked content from PDF document in PdfEditorDemo and WpfPdfEditorDemo. 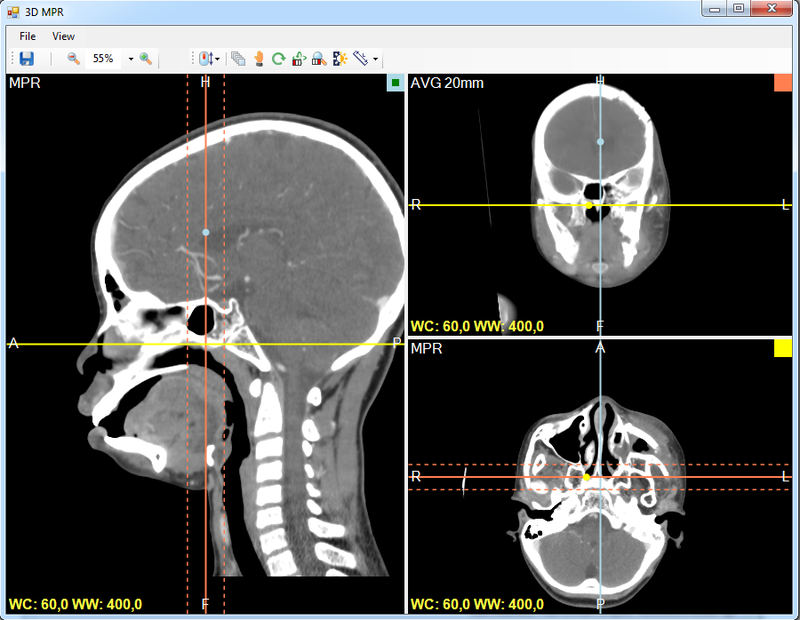 Added the ability to visualize DICOM multiplanar reconstruction in WPF image viewer. Added the ability to create DICOM multiplanar reconstruction from slices with irregular intervals. Added the support for the following DICOM specifications: DICOM PS3.5 2018d, DICOM PS3.6 2018d. Added the support for DICOM files with Flate compression. 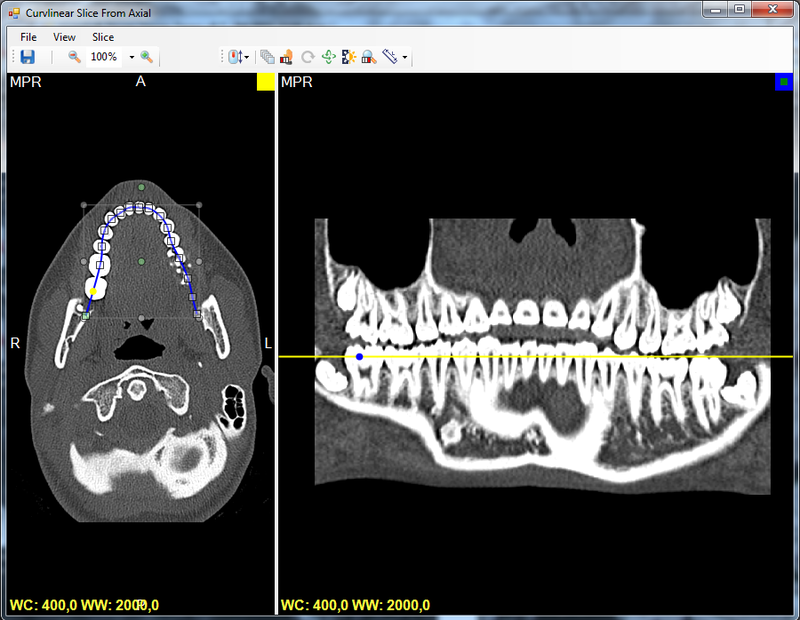 Added the ability to visualize DICOM MPR (2D MPR, 3D MPR and Curved MPR) in WpfDicomViewerDemo. Added several improvements in DicomViewerDemo and WpfDicomViewerDemo. Version 8.7.1.5 of VintaSoft Imaging .NET SDK has been released. Improved the algorithm of LZW decoder. Improved the algorithm of PDF/A-1a, PDF/A-2a and PDF/A-3a converters. Fixed the bug in PDF/A-1a, PDF/A-2a и PDF/A-3a verifiers. Added the ability to change font size and tick size in DICOM Axis, Ruler and Crosshair annotations. Fixed the bug in GetAlphaChannelMaskCommand class. Improved the algorithm that renders external fonts on PDF page. Optimized the memory usage in algorithm that renders PDF pages in 32-bit applications. Optimized the algorithm that renders PDF pages with text in invisible mode. Fixed the bug in PDF font controller. Added the ability to decode lossless JPEG images and TIFF images with lossless JPEG compression. Added several improvements in HTML5 and SVG image viewers. Added the ability to spellcheck text during editing of text annotation in WinForms image viewer. AnnotationDemo was added with ability to spellcheck text in text annotations using NHunspell spellchecker engine. WpfAnnotationDemo was added with ability to spellcheck text in text annotations using WPF embedded spellchecker engine. Added the ability to spellcheck text during editing of PDF text annotation and PDF interactive text form field in WinForms image viewer. Fixed the bug in algorithm that searches for text in PDF document. PdfEditorDemo was added with ability to spellcheck text in PDF text annotations and PDF interactive text form fields using NHunspell spellchecker engine. PdfEditorDemo was added with ability to spellcheck text in PDF text annotations and PDF interactive text form fields using WPF embedded spellchecker engine.